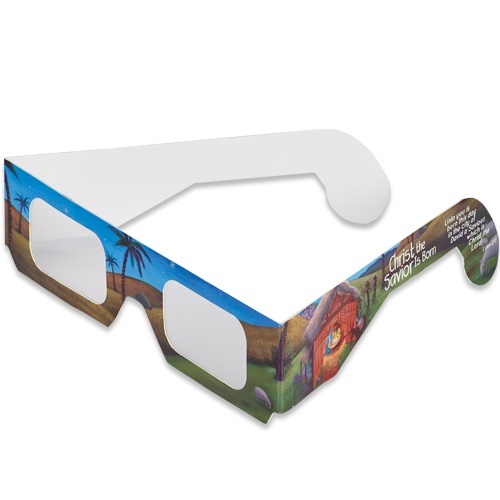 A unique and affordable prize for Sunday schools this Christmas and Advent season, these prism glasses shows the world in a new light. Plastic prism lenses are in cardstock paper frames and create a rainbow effect when looking at light sources. Perfect for looking at Christmas lights. The text on the side of the glasses discusses how the birth of Jesus changes the way we see the world. Also featured is Bible verse Luke 2:11, Unto you is born this day in the city of David a Saviour, which is Christ the Lord . A fun gift for children during Sunday school, special Christmas programs or services, or during family devotions. Recommended for ages 3+. Glasses measure approximately 5-1/2" across. Christ the Savior is Born Prism Glasses by CTA was published by CTA in September 2018 and is our 357th best seller. The ISBN for Christ the Savior is Born Prism Glasses is TDCSB18GL. Great for Christmas Party ! We run a small independent Youth Project and these are great to hand out to the Young People at the Christmas Party, some might call it stealth Evangelism ! Got a question? No problem! Just click here to ask us about Christ the Savior is Born Prism Glasses.